One thing (of many) that I love about my in-laws is that they are always up for an adventure, especially when it comes to food. So when they were in town for Vishnu’s graduation, it was one of our goals to take them to unique restaurants they may not try on their own. 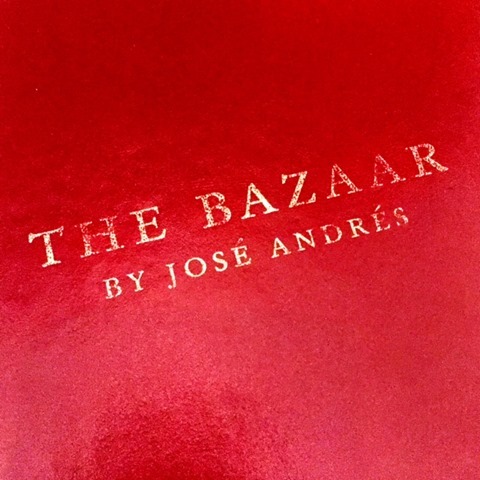 That goal coupled with our desire to try The Bazaar by Jose Andres, pushed us to make reservations for Saturday night. The price point for this restaurant is on the higher side, so it worked out well, since this was very much a celebratory meal. Before I share more about the restaurant and the food, I just want to note that I wasn’t planning on blogging about this meal in detail (never mind an entire post). However, I ended up taking (iPhone) picturess because my in-laws would pause and look at me as each dish arrived to our table. And if someone went to take a bite (usually me) before this happened, they would swat our hands away. They just assumed I’d be blogging about it, so I figured I may as well. So funny! I did edit the pictures to be a little clearer though (the lighting wasn’t the best). 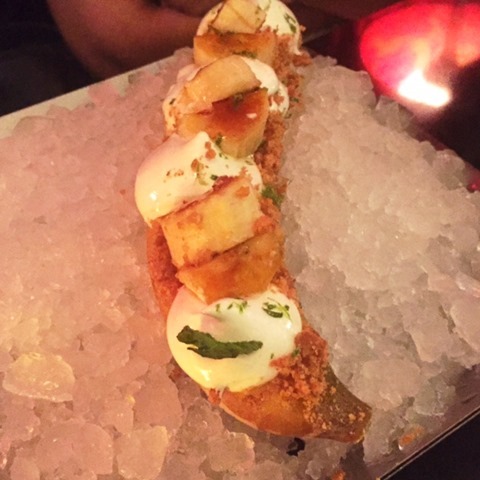 The Bazaar, located inside the SLS hotel in South Beach, is the brainchild of Jose Andres, a world famous Spanish American chef and restaurateur. First of all, the ambiance and décor is beautiful and very chic. Long red curtains, clean white walls, pillars with words written all over them, backlit pictures, candles – love! As soon as you sit down, you know you’re about to have an unforgettable meal. That brings me to service. Our waiter was nothing short of amazing. He made great suggestions (and told us what not to get), came by to check on us frequently, and really just made us feel like we were the only ones there. Now for the food! It was…an experience to say the least! 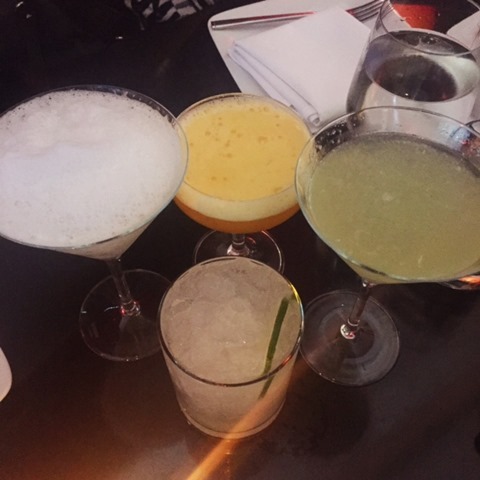 We started with drinks. I ordered a Moscow Mule (vodka and ginger beer), dad got a sea salt foam margarita (interesting concept with the foam), Vishnu got a drink called Big Bison (vodka, cucumber, and lemon), and mom ordered a virgin drink. Everyone was happy with their choices! I may have snuck extra sips of Vishnu’s drink because it was SO refreshing and light. Our waiter recommended that we order 5-8 tapas style dishes to share, so that’s what we did. Here’s what our order included. 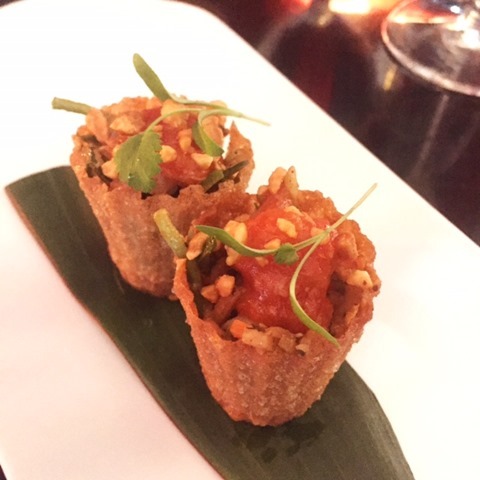 These were rice cups filled with veggies, peanuts, shrimp (for the fish eaters) and topped with a delicious chili sauce. One of my favorite dishes of the night! This dish was a unique take on the Spanish omelet. The eggs were cooked to a “perfect” 63 degrees, and because they were still liquid in form, we had to stir the mixture first before eating/drinking. Super interesting idea! My father-in-law loved it! 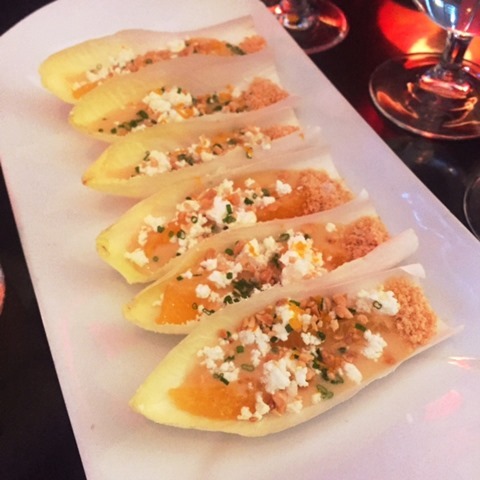 These were endive leaves filled with goat cheese, orange segments, almond dust, and orange dressing. Loved all the different textures and flavors in this dish. And that’s saying a lot since I’m not a huge fan of savory orange dishes. 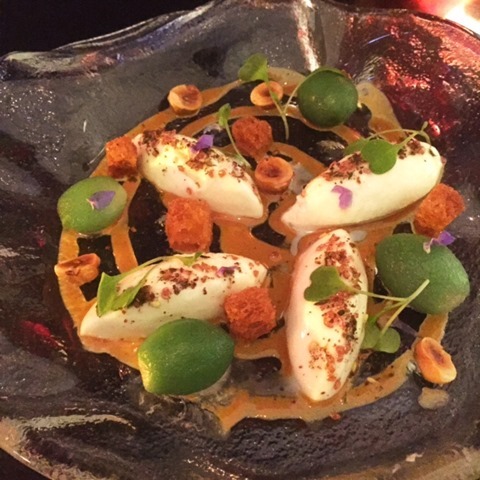 This was Vishnu’s favorite dish – Japanese baby peaches (the green things), burrata, and hazelnuts. Again, so many different flavors and textures that came together really nicely. The peaches were juicy and sweet while the burrata had a bit of saltiness to it. 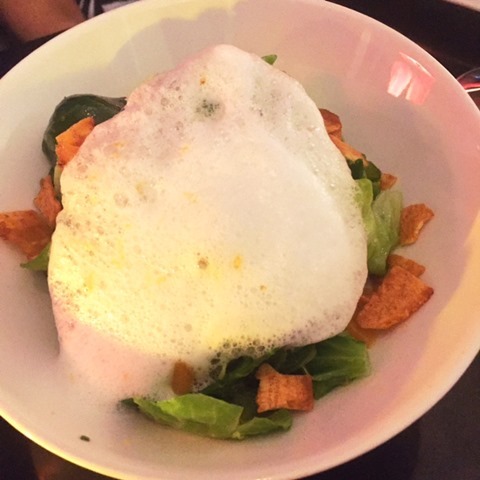 This was the best Brussels sprouts dish I’ve ever had! It included tender and slightly crispy sprout leaves, lemon puree, apricots, grapes, lemon air (I KNOW! ), and crushed plantain chips. Delicious doesn’t even begin to describe this dish. It was as if a flavor bomb went off in my mouth and I didn’t want it to stop! 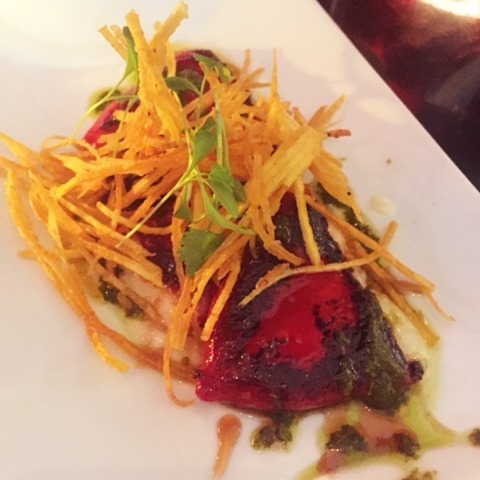 This was a stuffed pepper dish that included goat cheese, some kind of aioli/sauce, and plantain chips. Super flavorful. I didn’t try this sea bass dish, but everyone else did and thought it was perfection. 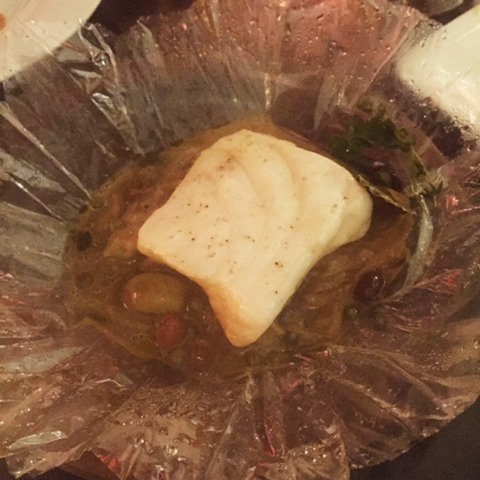 Vishnu said the fish was buttery and flavorful (due to the fact that it’s cooked in a bag with olives, capers, and a bunch of other stuff). Not going to lie..I was thisclose to being a pescatarian for a few minutes! It looked delicious. No surprise here but I loved this veggie/quinoa dish (as did my mother-in-law). The quinoa mixture was great, but the tamarind sauce stole the show! It was part sweet and part salty and finger licking good! Believe it or not, this was a banana mojito dessert. The outside of the banana was frozen solid while the inside was filled with a tart mojito sorbet. And for the s’mores dessert that stole my heart – dense chocolate cake topped with toasted marshmallow and chocolate sauce (created by lighting a piece of chocolate on fire!) with peanut butter ice cream and caramelized bananas on the side. HEAVEN! Needless to say, we all left full and happy. I’m so glad we got to share this experience with Vishnu’s parents. 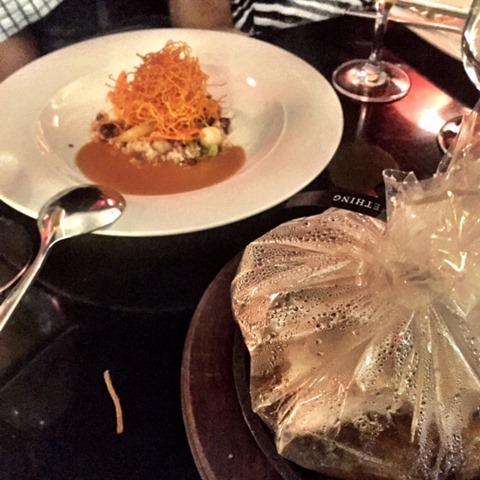 If you’re in Miami and looking to celebrate something special with a unique meal, we all highly recommend you try The Bazaar! What’s your go-to restaurant? Special celebration restaurant? this looks amazing! And I love that there are so many vegetarian options. Win! Yes! So many – I was really happy with that. And our waiter was awesome at making delicious recs! okay you guys need to be my new dining companions. Back home, mum and Niki are the worst- The same places and no adventurous spirit! This place looks amazing- Japanese baby peaches!!!! What an amazing celebratory meal!!!? Now that’s now you do it! The presentation of everything is spot on! 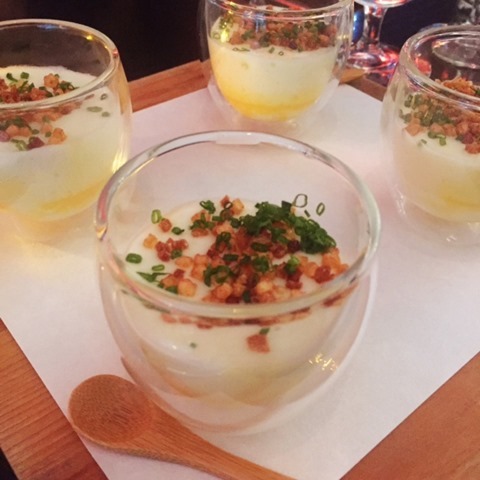 I’ve been to the SLS hotel in LA and have to say that your experience definitely surpassed mine. The food was pretty to look at! And did you go to the same restaurant in LA? I didn’t know much about him before this meal, but I love him too now! And it was def a meal to remember! Haha your pain laws sound amazing- love that they wait for you to take a photo before digging in..now that’s love!! 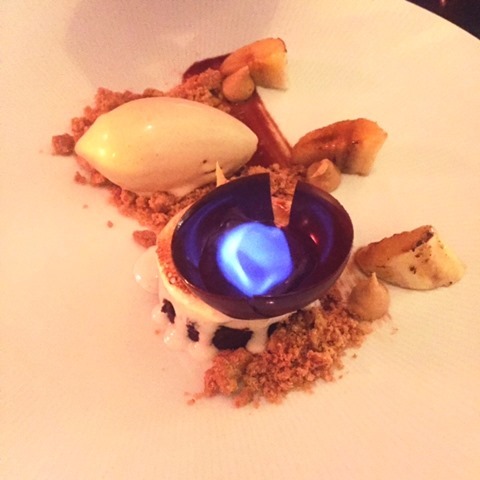 And any restaurant that features s’mores as a dessert options is a win in my books- this whole meal looks amazing…such unique dishes! That dessert! I was really hoping everyone would like the other one better, leaving the whole thing for me…no such luck!